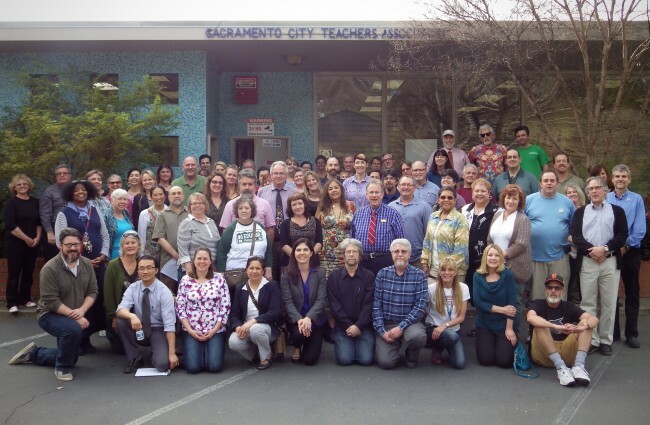 The SCTA represents all full and part-time teachers and substitutes, adult education, special education, pre-school and children’s centers, school counselors, psychologists, nurses, social workers, librarians and many others in the Sacramento City Unified School District. SCTA is an affiliate of the California Teachers Association (CTA) and the National Education Association (NEA). We have been in existence since 1921. The SCTA membership stands at approximately 2,500 in our 43,000 student district. Currently, SCTA is the 7th largest teacher union in California. We are located at our own 6,000 square foot building with plenty of parking at 5300 Elvas Avenue. The history of SCTA is rich with assertive support for collective bargaining and members’ rights and professional training. The past is filled with both concerted actions (four strikes) and current constructive efforts with the District to improve conditions for teachers and students. SCTA is very proud of providing one of the best contracts in the state, including lifetime health coverage, and a growing effort to provide professional representation and peer assistance for new and veteran teachers. There are numerous benefits of membership and many programs that SCTA offers to help teachers succeed in their profession.